South African officials are responding to public pressure to reduce or eliminate the use of whips in racing by running a whip-free race. A maiden seven furlong race at Turffontein went off Saturday as the first in a series of races that will be conducted in the country. The Racing Post noted the whip-free race took place on the same day as the Breeders' Cup Classic, where rider Christophe Soumillon's use of the whip on Thunder Snow would reignite debates about whip use in Britain. 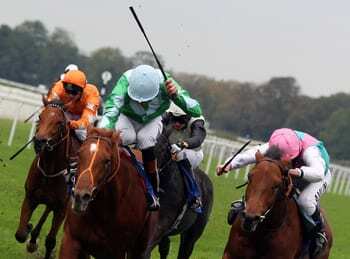 Arnold Hyde, acting chief executive of the National Horseracing Authority for South Africa said another such race will be held in the next couple of months. He said officials are still trying to determine whether jockeys will be allowed to carry whips but not use them, or will not be permitted to carry them at all in such races. Top South African trainer Mike de Kock trained the winner of the whip-free maiden contest and said the horse did not typically workout with a crop at home. Hawwaam finished first by a length, and the second-place finisher Reach For The Line was nine lengths ahead of the third-place horse. This entry was posted in NL Article, The Biz and tagged Horse Racing, Jockeys, Mike de Kock, South African horse racing, whips, whips in racing by Paulick Report Staff. Bookmark the permalink.